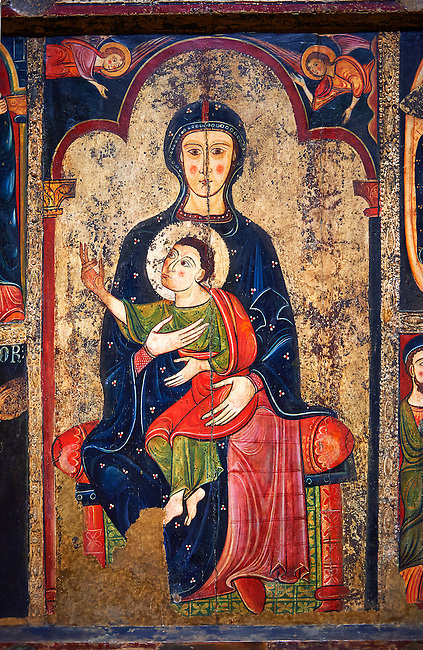 Around 1200, Tempera on wood with metalic ornamention from the church of Santa Maria d'Avia, Spain. The altar front of Byzantine art d'Avia depicting the Virgin Mary in the style of “Our Lady of the Way”. The artistic style of the Altar front relies heavily of Byzantine influences. The intensity and variety of colors and the systematic application of appliqué are typical of eastern Mediterranean and Byzantine art . This can also be seen in the style and hand positions of the Virgin Mary and child, at the centre of the altar piece, which copies a style known as “Our Lady of the Way” which in turn minics the orthodox icon “the Virgin Hodegetria”.